Hobart from the top of Mt Wellington! The past couple of days have been so much fun. I'd like to say right now - without exception - I love Hobart!!! Such a pleasing city. So much to see and do ... and so good to be here with friends. 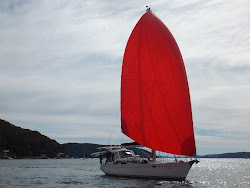 First off we celebrated boxing day with our little group of yachts here in the POW Bay marina. One of the key members of our group - Sharon - wasn't arriving until Christmas night due to family responsibilities. Because of that we decided to have our CD celebration dinner on boxing day evening. It was another special night with friends on boats. Our group dinner on 'Bogart' .. complete with roast veggies, turkey and gravy. Excellent!!! Everyone did their part .. Ian and Sharon on Turkey and plum pudding, me on veggies and salad and Peter and Sue on roast veggies. Great night and fun with great friends! The whole gang celebrating Boxing Day in style! Sharon and Me (with Ian doing the washing routine) ... dancing and singing along to "Happy" as we dry the dishes from the night's dinner. Doesn't get much better! The next day we drove into town and walked around the waterfront. We had been told the Mawson museum was worth a visit so we spent some time there. What an interesting exhibit and such a worthwhile memorial for so many men that spent hard times - some dying - opening up Antarctica to exploration and communication. The exhibit is a replica of the hut they built for their base station between 1912 and 1913 to study weather, magnetics and geology. In the 1950's there was a permanent base established there as a result of the work they started. The cramped inside of the Mawson Hut replica. Men lived, ate, slept and worked in this small wooden hut. A feat of selflessness and endurance! If you're ever in Hobart you should give this small memorial a look. That afternoon, with an easing wind and no clouds in the sky we decided to try and reach the summit of Mt Wellington again. For some reason I thought it would be an easy drive .. and not so steep. Wrong. It's a long way up to the top and a lot of the drive is more than steep .. it is precarious! As we angled our way up and up the road got narrower and the edges dropped away into, well, nothing. It's not all that bad (apparently) because there are a bloody lot of people doing the drive! The view from the top is amazing! Hobart and the waterways around it are laid out to see in, what seems like, tiny detail. The most startling element of being on the top was the landscape .. it was like being on Mars. Red rocks dotted the area creating an alien "moonscape". Quite alluring .. but so high and wild it was - to me - a bit nauseating. Beautiful - but "get me off this as soon please". George insisted on driving the car down the mountain - no problem from me! Some of the "alien" landscape with the breathtaking view behind it. Quite a place!!! Today was an even better day!! The 'Taste of Tasmania' started down around the waterfront. It is a 3 day celebration of wine and food from this fascinating Island. We went down for day one and I must say - and George agrees with me - the event is done particularly well. There is so much to experience and they have many many places where you can take your little tasting plate of food, with wine and beer and sit and enjoy. Even with a large crowd it was easy to find a place in either the sun, by the pier side or in the shade of a tree to enjoy your foodie find and meet people. The "Taste" runs for a couple more days and culminates with a New Year's Eve celebration at the water's edge. We - the 6 of us from Southern Belle, Bogart and Celay - have reserved seats for the NYE experience which we booked months ago. Looking forward to that! And then!!! As if the day wasn't as good as it could have been already .... we watched the two lead boats from the Sydney to Hobart race reach the finish line. We were there when Wild Oats XI won it's record breaking 8th line honours and we also witnessed the American challenger Comanche arrive about 42 minutes later with full spinnaker flying! Today's sights were on my bucket list .. I always wanted to be here in Hobart when the boats arrived and I accomplished it today! Yay!! Me and George in the crowd waiting for the first yacht to arrive. Wild Oats XI arriving at the dock in Hobart and in the process of dropping the main ... with all the spectator boats milling around. Great sight ...huge boat and such a great achievement. The American boat Comanche arriving about 45 minutes after WOXI with spinnaker flying! What a terrific sight! The whole of the Hobart dock area - with the Sydney to Hobart crowds - from the top of the car park we parked our car in. Spectacular sights and exceptional day!